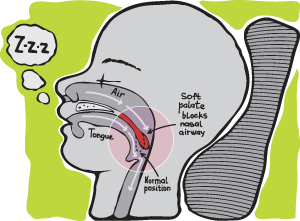 Sleep apnea is a sleep disorder where there are abnormal pauses of breathing or low breathing during sleep. An apnea is the pause in breathing and can last from 10 seconds to minutes, and can occur 5 to 30 times or more in an hour. Sometimes it comes with those who snore very loudly or have abrupt snoring or breathing patterns. An overnight sleep study is essential in diagnosing this disorder. Symptoms of patients that suffer from sleep apnea include daytime sleepiness and fatigue. It’s co-morbid with diabetes, high blood pressure, reflux disease, TMJ issues and a host of other medical issues. If you have a child or notice kids that are snoring, they can have both sleep apnea and bruxism so please make sure they get check out. Bruxers are highly correlated to apnea so sometimes treating the apnea will eliminate the grinding. Depending on the severity of sleep apnea (mild to moderate), which will be determined by the sleep study, an oral device may be the treatment of choice. This is a custom made oral device that shifts the lower jaw forward and opens the bite. This in turn will open the airway. Not all dentists in San Francisco understand these conditions and treatment so please be careful when seeking advice. If your disorder is found to be severe, the oral appliance is insufficient and usually a machine for positive air flow is necessary (CPAP). Feel free to contact the prosthodontists with any questions.